Cities in Motion Giveaway and Paradox Month! Big news for GameSessions! We are launching the Paradox Month. This includes a new giveaway: Cities in Motion, and big discounts on several Paradox titles. For the occasion, we have added a Quick Buy option on some of our game pages: you can now buy Steam Keys directly on our website! If you want to add Cities in Motion to your Steam library, we’re offering a deal to buy a key for $5.00 (75% off) in-game or on the game page. If you played it on GameSessions before buying it, you will be able to transfer your progress to the Steam copy of the game. 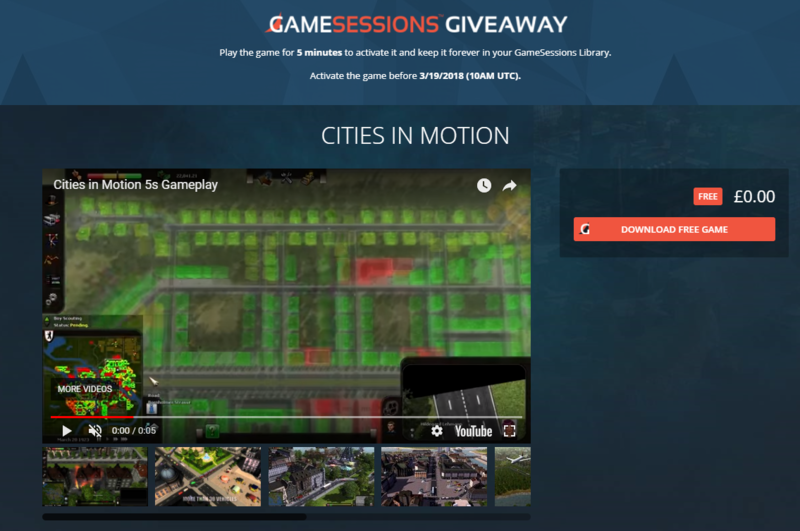 To claim your free copy of the game, just log in to your GameSessions account and download Cities in Motion. Play the game for 5 minutes to activate it and it will then be yours to keep forever on GameSessions! You need to activate the game before the giveaway ends, on Monday 19th March (10:00 UTC)! If you liked Cities in Motion, why not also try Cities in Motion 2 or Cities: Skylines? I need a litle help. I downloaded and installed the game, and when i tried to start to play the 5 minutes. it crashes right after i klick on the “log in” button. I tried an Uninstall+Reinstall, and closed everything that runs in the background. I experienced this before when the Painkiller was in giveaway (and because of this it doesn’t got activated). Hi, could you send us a ticket so that we can take a look at your account? Are you using a Windows PC? If not, that can be the reason why you cannot see the link. Thank you so much GameSessions, keep it up good work.